Wired Magazine brought their tech curation skills to NYC again this year, hosting a popup brick-and-mortar that felt more like a cool science fair than a holiday retail store. The Wired Store showcases some of the most interesting new tech gadgets of the year. The store moves around annually, and is located in the Meatpacking District this season. 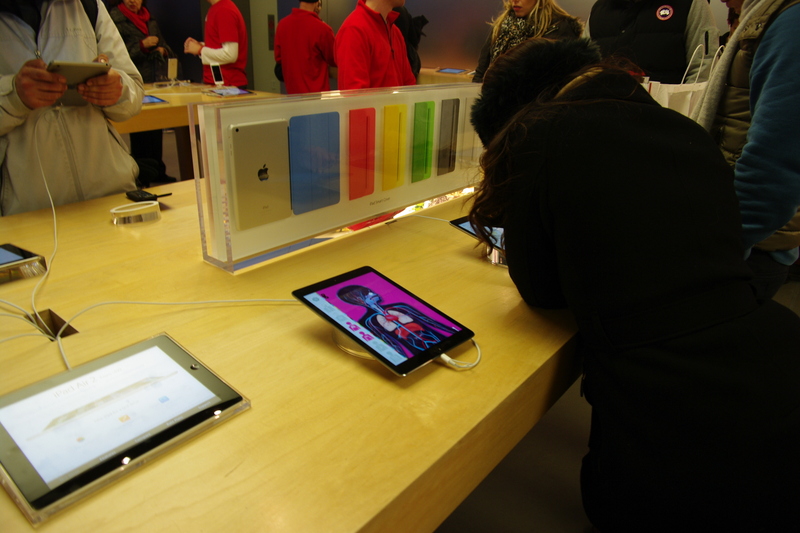 The crowd was a mix of shoppers, tourists, families with children, and tech geeks. Gadgets ranged from cars, bicycles, 3D glasses, educational apps, games, tents, and more. We’ll focus on the ed tech gadgets, with a few gratuitous games thrown in for fun. Kim Kelleher, Publisher of Wired, spoke to Triangle Below Canal about the store. “We’re celebrating the 10th anniversary of the Wired Store,” Kelleher cheered, adding, “If you’re looking for ed tech, you’re in the right place.” Kelleher and her team shared that Wired covers quite a bit of education technology, and the Wired Store appears to be an extension of that commitment. 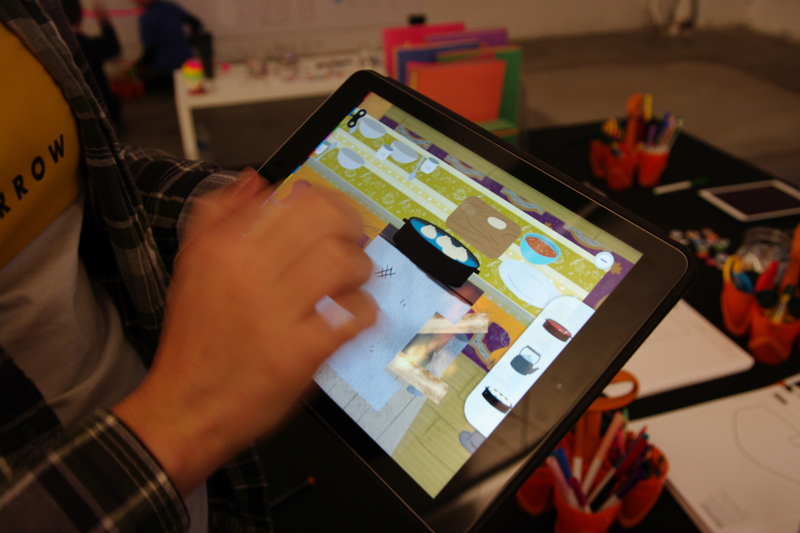 Wired curated some of today’s coolest games and apps for inclusion in the exhibit-like space. Two of the educational gadgets featured use apps to facilitate learning for primary and middle school children. It’s pretty clear how timely the apps are, but a little data doesn’t hurt: A 2013 study by Common Sense Media found that 72 percent of children eight and under use tablets or smartphones (up from 38 percent in 2011), as well as more than a third of children under two. 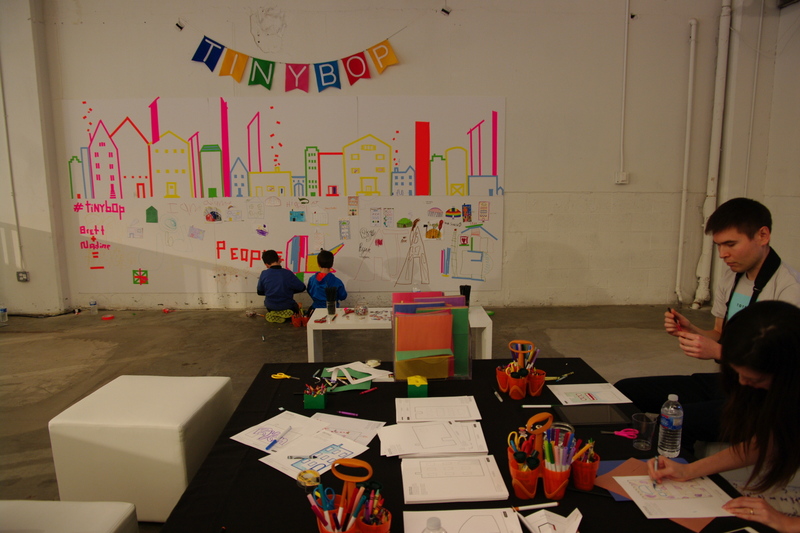 Brooklyn-based educational app company Tinybop occupied a large exhibit space complete with activities for the kids, including a mural kids could write on. Given they are local, Tinybop had lots of folks on hand to showcase their newest iOS game, Homes. If Tinybop can build on the success of their two earlier games—The Human Body and Plants—they would be in a fine position for sure. The Human Body was downloaded 4.7 Million times in one week (after being featured as the free app of the week)—every app maker’s dream. So how did they make it a reality? After creating The Human Body, Tinybop had planned to give out several promo codes for free downloads, particularly to underserved schools. But the App Store only allots 50. So they reached out to inquire about more. Apple responded by featuring The Human Body as the free app of the week, putting the app’s inertia in play. And if you’ve been to an Apple Store recently, you might have noticed that The Human Body is featured on the splash video across all devices. Additionally, over 30,000 schools around the world have purchased the app through Apple’s Volume Purchase Program. Tinybop’s games are crafted to help children gain context, of the body, the natural world, the home, etc. They are beautifully designed—the visuals, the sounds, and the immersive play. Award winning illustrator Tuesday Bassen designed the highly lauded visuals. And the team’s sound designer created original sounds for the games. The team includes research associates and other educational specialists to align learning and curricula into the app. The attention to detail is part of what makes the app so right-on. Kika Gilbert (Community Manager of Tinybop) left, demoing Homes app to Kim Kelleher (Publisher of Wired) right. Tinybop’s Wired Store space included a mural for kids to write on. Some down time featured. The kitchen of a home in Mongolia from Tinybop’s new Homes app. The Human Body app by Tinybop as featured on devices in the Apple Store. What’s the first thing most kids do upon entering the Homes app? “Make a mess!” shared Kika Gilbert, Head of Community at Tinybop, and on-hand at the Wired Store exhibit. “Homes encourages children to build empathy and cultural understanding of how people live around the world,” she added. The app starts by allowing users to choose a home from among a few countries, including Mongolia, Guatemala and the US. Users then get to explore various rooms in the home and engage with everyday household items. In Guatemala, one can enter a room with a loom, choose a fabric, work the loom, and then use a sewing machine to make a pair of (awesome) pants. In Mongolia, users can enter the kitchen, cook, and then eat a meal that includes some yummy looking dumplings. “There are no people in the games so kids can imagine themselves in it or imagine the people who live there,” stated Gilbert. 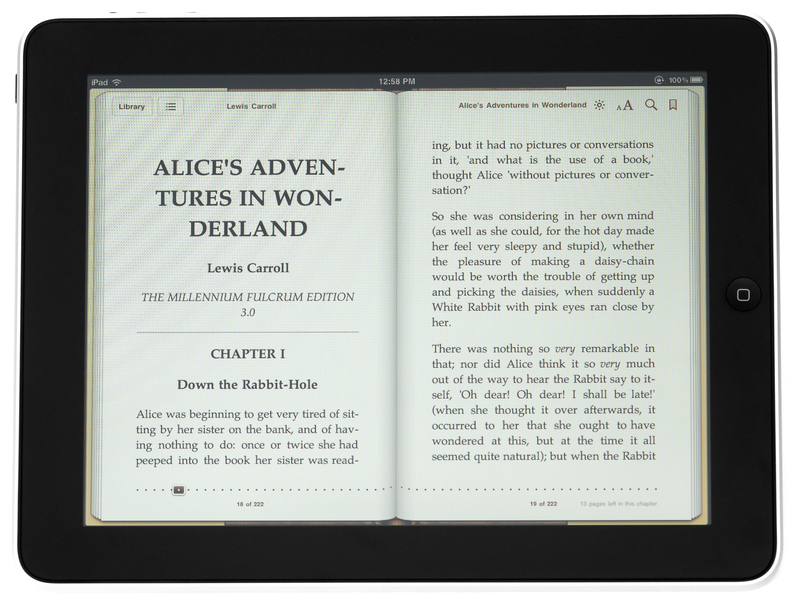 The Homes app uses features of a smart device to complement learning. For example, when users look in a mirror on the wall of a room, they can see their reflection, an image that is pulled live from the camera lens. Additionally, users can upload their own photos, add them to frames, and place them on the walls of the home as custom decorations. A parent dashboard includes handbooks in 12 languages to help families and teachers guide student exploration, including co-play ideas. For example: How is my home similar or different than the homes featured in the app? On the product map for the dashboard is a recording function so that kids and their parents can leave questions for one another directly in the app. Because of strict data rules associated with children under COPPA (the Child Online Privacy Protection Act), the app does not send usage data back to Tinybop. Gilbert let on that Tinybop has two new games in the pipeline. She wouldn’t give details, adding, “We get a lot of requests!” So better to stay mum until the games are out of development in case anyone is disappointed their idea wasn’t chosen. Both The Human Body and Plants took about 8 months to develop, with Homes taking more like 5-6 months. The new games are expected in Spring 2015. Currently, Tinybop apps are only available in iOS (and utilize Apple’s new programming language, Swift). The folks at Tinybop plan to focus on making more iOS apps before considering Android. The Homes app is available in 59 languages. The sweet spot for age range is ages 4-10. Homes costs $3.99 to download. The Ozobot might come in a small package, but it’s a showstopper. One of several new games/toys to help introduce programming to children, Ozobot is a ‘smart robot’ designed to teach robotics and coding through games. 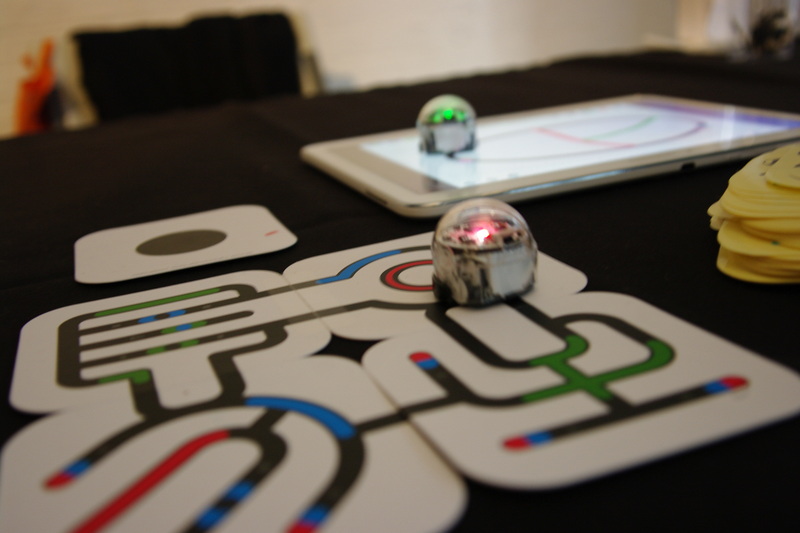 Place Ozobot on a smart phone, tablet, or piece of paper, and watch him cruise across mazes and tracks. The toy reacts to lines, colors and patterns. Ozobot comes with a free app and pre-printed ‘track’ cards to facilitate learning, and single and multi-player gaming. The team at Ozobot created 4 lessons that match up to CORE, STEM and STREAM curriculums. The lessons range from “the most basic levels of robotic behavior to sequential programming and complex algorithms.” While it is cool to watch Ozobot go on a smart device, the fact the it works on paper increases its flexibility and accessibility–always a good way to reach more learners. The cost is $49 for a single pack. Ozobot following lines, colors and patterns on both paper and a tablet to help teach kids about robotics and programming. Voxiebox brought their holographic entertainment system all dressed up as an arcade-style video game. With its physical size and its colorful images, the game elicited a lot of gawking. The arcade frame included four stations with control panels on each side of the box—sort of like playing Ms. Pacman/Galaga exponentially and standing up. It was 3D without the goggles. The system can be rented for a pretty penny. 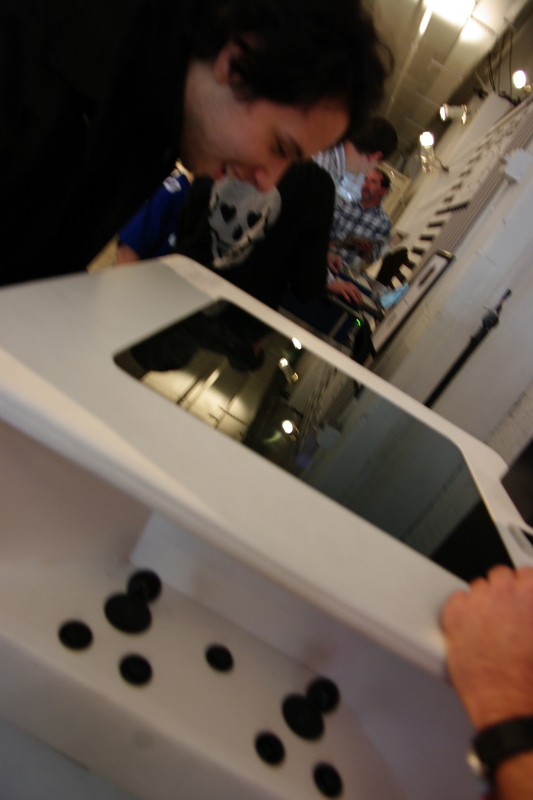 A Wire Store visitor playing Voicebox’s hologram arcade games. Speaking of 3D, Oculus Rift virtual reality glasses were a popular item with store visitors. Try them on, look silly in front of perfect strangers, but feel cool because you are literally in your own world. The game on display was pretty basic–you are a man walking around your home, garage and lawn. You might recall, in March 2014, Facebook acquired the makers of the glasses, Oculus VR, for $2 billion in cash and Facebook stock. The glasses run at $350. 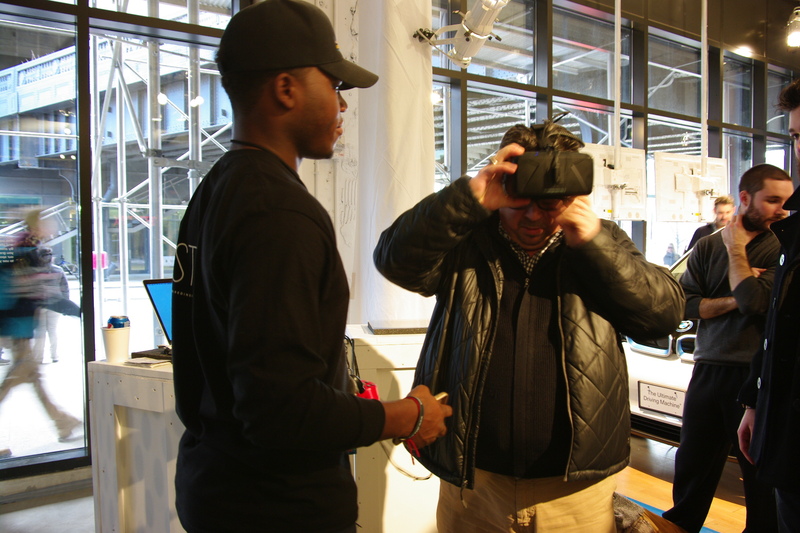 A Wired Store visitor adjusting the Oculus Rift on display. Swedish designer and craftsman Love Hultén took a compact approach to arcade gaming with the R-Kaid-R (pronounced Arcader). 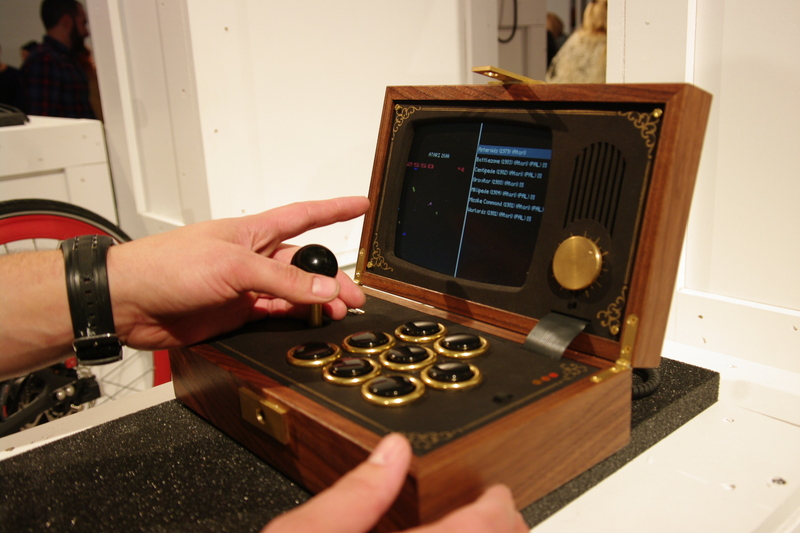 Inside of a well-crafted wooden case (designed to develop a beautiful patina over time) is a portable arcade system that stores over 10,000 games. Hultén clearly has a love for the old school, including classic games. The R-Kaid-R is not cheap, but it is the type of gift that would make any gamer feel classy, San Diego [gratuitous Anchorman reference]. Swedish designer and craftsman Love Hultén’s R-Kaid-R (pronounced Arcader). 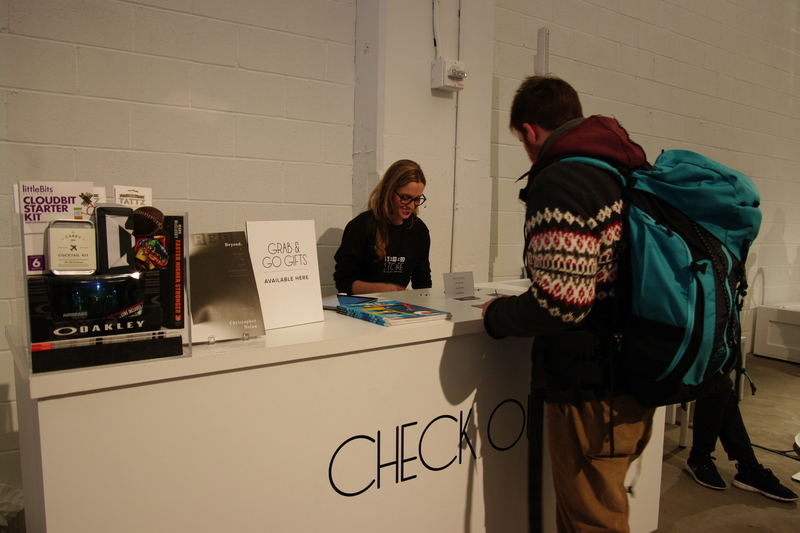 The Wired Store brick-and-mortar in NYC is open from December 11-21, 2014. If you can’t make it in person, try their online store. Wired Store check out and prize collection station. There have been successful EdTech MeetUp transitions in the past, most notably in San Francisco when LearnBoost passed organizer duties to edSurge in December of 2012. But other city’s transitions have not been as seamless. Denver is currently without a formal organizer. We spoke with two long-time co-organizers of the NY group to reflect and project about the transition: NY EdTech Founder Tom Krieglstein, also Founder at SwitftKick, a student engagement company; and, co-organizer Sharon LaDay, Vice President of Business Development at Macmillan New Ventures, an arm of Macmillan Publishers that invests in ed tech companies. Krieglstein and LaDay, along with co-organizer Adam Aronson, Sr. Product Manager at Pearson, will be advisors to the new leadership team until they come up to speed. So why is NYC such a key location for Ed Tech? “The size. Of both K-12 and colleges. Just the density of the opportunity,” cites Krieglstein. “Access to talent—educational and technical experts. Access to investors. Here you could take a train ride, or walk around Union Square and meet with a lot of investors in one day.” He also noted many titans of industry are here, for example, large publishing companies. The publishing companies tend to work at a more measured pace, while startups feel the pressure to move quickly. Working in education requires patience. There are numerous stakeholders to consult, and a long sales and implementation cycle. Those Ed Tech startups that can figure out how to balance the manic pace of the city with the careful needs of the education community often fare better with all of their stakeholders. Ed Techs in New York City have a supportive community for these and other challenges. In May, NYC Mayor Bill de Blasio announced a $20 Million investment in new devices and software and a $650 Million capital investment in wiring and hardware to keep up with what the government called the ‘tech ecosystem’. There is still some question as to how much of that will impact startups. EdTech MeetUp groups in other cities have historically been run by a company or organization. “What makes us different is that we are just people. A MeetUp in every sense of the word,” adds LaDay. While San Francisco is organized by EdSurge, an online resource for the Ed Tech community, New York will remain run by individuals. Who Do EdTech MeetUps Help? EdTech MeetUps have a wide audience: those new to the industry, those looking to network for a specific project, and the usual suspects who have committed to attending multiple events. Typical archetypes are the Educator, the Technologist and the Entrepreneur. Krieglstein highlighted Brainscape. “Andrew Cohen is one of our longest standing members. Every MeetUp, he would stop by and give me these updates. It was fun to see his company grow.” He also gave a “shout out” to Kate Meersschaert and the Ed Lab at Columbia University’s Teachers College. As often is the case with EdTech MeetUp leadership, their day jobs have grown into more demanding positions over the years, perhaps even in part because of their leadership in the community. Mark Phillips, Managing Director of HireEd, an education recruiting firm, and a former organizer of the Denver EdTech MeetUp, understands that situation all too well. He and Dan Carroll, COO and Co-founder of Clever, an instant login provider for students and schools, founded a Colorado MeetUp, alternating event locations between Boulder and Denver. As their companies grew, the time commitment became an issue. Phillips, similar to the NY EdTech leadership, cited the broad scope of the MeetUps as a potential challenge. So many groups sprout from meeting at EdTech MeetUps, and then focus on their specific area, that it can be difficult to establish a core group. Sometimes, the ‘sprouts’ stay within the core EdTech MeetUp family. Phillips noted that the Austin EdTech MeetUp founder came from Denver, where he attended MeetUp events, and was interested enough to get the group off the ground in Austin when he moved there. LaDay noted that NY EdTech MeetUp, or perhaps others, might take the lead in connecting regional EdTech groups. Early on, LaDay and team reached out to EdTech MeetUp organizers across the country to try and create a “connectedness” among the MeetUps. They were considering “some unified drive to stoke a national conversation so all the troops could be rallied for key issues.” They organized a call with SF, NYC, Austin and Chicago, but that plan did not formally develop. The groups do show alignment in their descriptive language on MeetUp websites, with some nuances to highlight their regions. When asked what he wished he knew before starting the group, Krieglstein paraphrased an Ira Glass quote: “The vision in my head was over here and the reality was over there. And that frustration was OK.” Which event was his favorite? “The first one! Just the fact that we had one, and that people showed up who weren’t me.” They are also proud of their holiday party MeetUp as it raises money for charity. In answer to the burning question, who writes the MeetUp event titles, the team spilled that it is co-organizer Adam Aronson. A favorite title (and not surprisingly, a big draw), the Biggie Smalls inspired, “I Like It When You Call Me ‘Big Data’. NY EdTech MeetUp will hold their 2nd Annual EdTech the Halls: Holiday Bonanza for Charity on Wednesday, December 3rd in at New Work City co-working space in Tribeca, NYC. Did you know companies that practice “conscious capitalism” show a 1600% higher return on profits? And that companies with a more diverse board are more profitable? A recent panel in NYC called Entrepreneurship with a Conscience hosted a discussion on ‘doing good’ with your business (plus some great tips for finding, starting or raising money for that new idea). Moderator – Marshall Heinberg, previously Head of Investment Banking and Senior Managing Director at Oppenheimer & Co., Inc. Given the title of the event, as well as the hosts—a group of ‘Friends’ schools—many of the moderator’s questions had an ethical angle to them. ‘Friends’ schools are known for their Quaker roots, and in the case of Brooklyn Friends, as well as others, encourage leadership in areas such as service and ethics. The panel topic is timely, as businesses with a focus on socially responsible causes are on the rise. Why a Socially Conscious Business? Many folks have heard of Warby Parker. They sell high-design eyeglasses at a value price using a model that has disrupted the market: It allows customers to order eyeglasses online, try them on at home, and then return the unwanted glasses. Co-founder Neil Blumenthal followed his ‘Friends’ education with a not-for-profit job selling glasses to people making less than $4 a day, then with a stint at Wharton business school. Among his advice to the audience: hire for passion, think about long term impact, and build a stakeholder-centric model. He noted that at Warby Parker, they screen “entitlement” out in the hiring process as the “root of all evil”. For Jessica Holsey from Susty Party, an undergraduate degree from Harvard led her to her dream job on Wall Street. Inevitably, the question ‘to-grad school or not-to-grad school’ arose. But the entrepreneurial itch kicked in, as did the desire to create something that had a positive impact on the world. Enter Susty Party—based in Brooklyn, NY, Susty creates disposable tableware that is compostable yet colorful, party-ready, and responsibly made in partnership with non-profit factories who employ the visually impaired community. When panelist Peter Laughter shared his point of view as the CEO of a Wall Street recruiting firm and founding member of NYC’s Conscious Capitalism, the audience needed a bit more orientation. What is Conscious Capitalism [besides, seemingly, an oxymoron]? Applying a multi-stakeholder model to your business is one thing. Splitting the highest leadership duties quite another. Neil and his Warby Parker co-founder, Dave Gilboa, are co-CEO’s. According to Fortune magazine, “in the last 25 years, only 21 companies in the Fortune 500 have used the co-CEO structure,” (before Oracle added itself that list in September 2014). These numbers suggest that for larger companies, co-leadership has a ways to go, but for smaller companies, faces fewer obstacles. Neil explained that because ‘Work’ is evolving, turning into more of a community, this evolution lends itself to a shared leadership style. He likened it to a flat organization, an organizational model that is very popular among startups, and where titles may not be indicative of roles or reporting structures. According to Neil, “If you ask people at Warby Parker, they would say Dave and Neil share a brain; and that’s good.” When you are a founder, “It’s not work-life balance, it’s work life-integration,” punctuated Neil. In Jessica’s case, she and her co-founder and co-president, Emily Doubilet, have complementary skills. Jessica is highly adept at finance while Emily excels at the creative. If the business question at hand is operations or finance oriented, Jessica will likely have the final word. It seems every business has gone green, from your bank to the oil companies to the dry cleaners. So how do you tell green fact from fiction? Greenwashing is the practice of using marketing and PR to deceptively present a company or its products as green, when in truth, they are predominantly not. Panelists advised businesses could seek a B Corp certification, which signals to consumers that the business has been certified by the nonprofit B Lab “to meet rigorous standards of social and environmental performance, accountability, and transparency.” B Corp likens itself to the Fair Trade movement for coffee. Warby Parker knows that its consumers care about doing good. But when their customers look to buy a pair of eyeglasses, fashion and cost come first. The company made a choice to integrate social good into their culture—it drives internal mission and philosophies, and helps with recruiting. According to the company, Warby’s “Buy a Pair, Give a Pair” program has contributed to the distribution of over one million eyeglasses to people in need. Additionally, Warby Parker works with partners who train men and women in developing countries to give basic eye exams and sell glasses to their communities at affordable prices, thus positively impacting local economies. So what keeps Warby Parker up at night? “Are there four guys somewhere thinking about how to disrupt us?” asked Neil, then assuredly answering his own question [Yes]. “The cost of starting a new business is decreasing. So are we moving fast enough? Talent—are we hiring the right people for the role?” Given there is a shortage of engineers, product people and data scientists, Neil added that businesses have to be thoughtful about hiring. Network – Treat networking like mediation or any other practice. Don’t just network when you need it. Ask to help – Ask people what you can do to help. Be a value creator. Meet investors in advance – And vet them the way you would new hires to test fit. Acknowledge what raising money means – Investors are expecting a liquidity event. If you want to run your company for a long time, your way, then raising funds might not be right for you. Plan – What are you going to use the money for? Hiring, new products, etc. Ask for more – value your business and ask for what you are worth. Entrepreneurship with a Conscience was hosted by Brooklyn Friends School, Friends Seminary and Sidwell Friends at Dillon Gallery in NYC. Halloween NYC 2014: Day of the Dead a New East Coast Trend? Halloween in New York City is always a complex beast. If you live here, you know getting around the Village Halloween Parade can be true hell, especially if you are not actually trying to see it, but rather simply get across 6th Avenue. You know that getting a cab has always been nearly impossible, and getting one in the rain actually was impossible (though Uber changed that this year!). One trend, both among adults in NYC and children on Facebook posts, is that Halloween revelers painted their faces and bodies in traditional Dia de Muertes skeleton styles. Does this portend the commercialization of yet another holiday? After living in California for many years, I got to know some West Coast and Mexican cultures that East Coasters had not been historically exposed to. Mexican Food that was not Taco Bell or Chili’s; the notion that nobody walks in LA (not true by the way), and the celebration of unique holidays such as Cinco de Mayo and Dia de Muertos, or Day of the Dead. Cinco de Mayo has been nationally commercialized here in the States. While many Americans do not know what is being celebrated, we’ve managed to make it into a party holiday (surprise, surprise). Cinco de Mayo is not Mexican Independence day as some may think. It is a remembrance of a battle between the Mexicans and the French in 1862. The Mexican army defeated Napoleon’s on Mexican soil in an improbable David and Goliath scenario. Mexico lost the war, but the battle served as a source of great pride, especially among Mexicans in the California region. The holiday was more popular in the US than in Mexico for years, but has since been gaining more attention in Mexico as well. Like Cinco de Mayo, Day of the Dead was not always fully celebrated throughout Mexico. Dia de Muertes, a celebration that honors those that have passed away, originally occurred earlier in the year and is thought to have originated from pagan practices. The date was changed to coincide with All Hallow’s Eve in order to align better with the Catholic Church, though some rejected the integration of pagan practices into the celebration. Day of the Dead or Dia de Muertos is now a national holiday in Mexico. Cinco de Mayo was easy to commercialize. The holiday was not as sacred in Mexico. And beer companies, many of which have Mexican brands, discovered good synergy for product promotion. Day of the Dead is rising in popularity in the United States, but is by nature a more sacred holiday. Makers of Halloween costumes might be able to capitalize on the trend, though it can mostly be achieved through face paint, and does not necessarily require a specific costume. We might see growth of the holiday in regions with expanding Mexican ties, like NYC. Leaving flowers for the dead is part of the holiday tradition, as are colorful headdresses, so perhaps florists can come up with organized product lines to match the spirit of the holiday. Artwork is also a good match with Day of the Dead celebrations, so the art community could participate more in the celebration nationwide. I did note that video game and mobile game developers were offering in-game purchases opportunities tied to Day of the Dead such as avatars and challenges. Day of the Dead is a bitter-sweet holiday. The tradition is enthralling. If the holiday does becomes commercialized in the US, let’s hope it’s based in honoring those that came before us with thoughts, beauty and art. This post originally premiered on the Communications Week Blog. Communications Week is a cross-industry celebration of the public relations, communications and media industries. The inaugural week consisted of inspirational, informational and social events for those interested in PR, communications and media held at various locations around New York City and online. 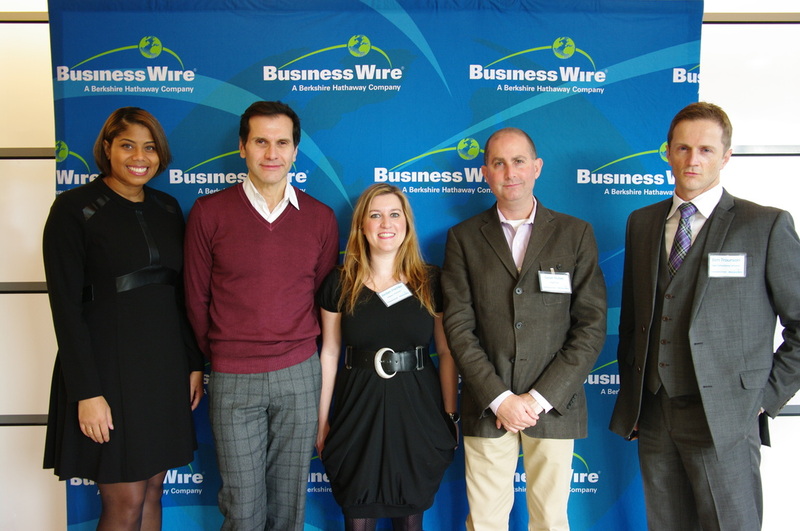 The inaugural Communications Week kicked off on Monday morning in New York with a State of the Union breakfast session, hosted by Business Wire. The event teed off the weeklong conversation of how media, communications and PR professionals are working together in times of media disruption. The conversation was led by a diverse panel of PR and marketing all-stars at the Thomson Reuters building in Times Square, merging an incredible view of New York City with a stellar group of communications pros. The theme of the panel, Living in Times of Media Disruption, drove the discussion full steam, with tips on staying ahead of the evolving definition of media, including cross-departmental collaboration, social media ownership, earned vs. paid media, content creation and future disruptions. Led by panel moderator, Steve Rubel, Chief Content Strategist of Edelman PR, key themes emerged from both the panelists and the audience. Media has evolved from a one-dimensional definition to being more “what you want to make of it,” according to Nelson Freitas, panelist and Chief Strategy Officer at Wunderman. New media is playing a huge role in this evolution. How do we communicate and measure the value of non-traditional media, especially to our internal stakeholders? As individuals become content disseminators, how do we tap into them as an authentic source of media, and how do we better follow their individual voices? The question of ownership surfaced a lot—who owns social, for example? Collaborating across functions and channels, as well as being strategic about content came up as tactical recommendations. Reacting in real-time, which has always be an important tactic in PR, is now impacting marketing more than ever. Strategically managing relevant, real-time interactions across all communications is becoming a competitive advantage. Tiffany Guarnaccia, the Founder of Communications Week and CEO and Founder of Kite Hill PR, kicked off the event with and an introduction on the spirit behind Communications Week—the collaboration of stakeholders in public relations, communications and media industries to discuss key topics such as disruption in the media. Rubel first asked each of the panelists to give their unique definition of ‘media’. Cathey from Viacom noted that with their diverse holdings, including MTV and Paramount Pictures, Viacom has a diverse, multiplatform view, in real-time and across various channels and audiences. She said that media first encompasses content and is also the lens of the news, including both bloggers and traditional media. Freitas of Wunderman, WPP group’s network of advertising, marketing and consulting companies, noted that media was once defined as one-dimensional. Now, it’s almost what you make of it. It depends on what story do you want to tell and through which channels. Right now, Freitas is interested in the power of the individual as media; he noted that millennials trust individual voices, such as reviews on TripAdvisor, for example, more than they trust a brand message. Fischler from Allison+Partners said that, as an agency representing various clients, defining media involves finding where that audience is and the right method to reach them. She emphasized that media encompasses a balance of paid, owned and earned media. Trounson represented the point of view of a B2B consultancy, highlighting that relevancy and context are key. In addition to connecting via traditional media, connecting with influencers on social media is extremely important, as is moving away from a shared voice with competitors and focusing more on the individual. Cathey shared that Viacom watches how the audience reacts in real-time (e.g., Snapchat during the VMAs). You have to understand how you can amplify your message across various teams and channels. She also noted that we are seeing collaboration now where we once saw silos; the lines of communication are blurring more and more. Viacom has a ‘marketing council’ which brings stakeholders such as marketing and PR to the same table to discuss those matters. Trounson noted TCS is a large, conservative organization; they are presented with the challenge of addressing social media ownership. Everyone on the marketing team now has access to admin rights, and they’ve all agreed not to be “a cowboy.” He also addressed an important fact that with social, you can’t always plan six months out. Fischler noted that Allison+Partners has a voice in the larger conversation because of an agency’s inherent variety of clients, vs. being in house. They work alongside CMOs, brand managers and product managers to provide overarching insights, as do their connections at other agencies. Fischler shared that although the panelists’ companies are different, many organizations are in a similar place on the subject. Next Rubel asked, “How do you share information internally or with clients about traditional media consumption vs. non-traditional?” He briefed this by saying that PR pros outnumber journalists—there are more folks calling and emailing than ever. How do you get your message across? Trounson gave examples of his organization’s new initiative to sponsor the [TCS] New York Marathon. How does the New York Marathon connect to their core business of data and IT consultancy? The sponsorship is an opportunity to make something new happen, and they have eight years to play it out. With a new app that displays where all the runners are from (Britain, India, Brooklyn or Queens) and their running stats, they have an example of connecting data with the marathon and the highly motivated people who participate in it. Additionally, the initial media story about TCS sponsoring the New York Marathon ran in an online medium, but not in print. This is an example of where the communications pro needs to remind the value of print vs. digital to internal stakeholders, some of who might see print as more valuable. But if online has more readers, which one is truly worth more? Fischler shared her answer to clients who ask to be placed in print: “Why?” As the session audience chuckled, she added, “Are you looking for cache or are you looking to drive users?” If you have a digital business, online media placement can be more valuable. “The notion of influencer programming is more visible now.” For example, using IZEA to find the right influencers in social media. Rubel asked, “How do you discern between promotion and brand protection? Cathey from Viacom noted that preparation is key. “Especially if you know that content is going to have a reaction.” She supplied MTV’s Buckwild show as an example. Viacom also just launched an echograph to measure engagement, which is helping them anticipate and engage in real-time. For Cathey, it can be about “defining a win in a new way.” Thus, she advises educating your team [on new media], including executives. Being on BuzzFeed or Perez Hilton might be a bigger win than being in traditional media, depending on the audience. She also recommended having people with different perspectives weigh in on campaigns to avoid pitfalls, such as with topics on race or gender. Trounson shared that a competitor of theirs pumps out new research everyday. For TCS, it’s more about quality than quantity—about being more strategic. For an upcoming trip, Trounson has new meetings for his CEO with non-traditional media, which is a departure from his usual agenda of sit-downs with traditional media. Rubel asked the panelists, “With regard to content, how much time are you spending creating or shaping content to direct media coverage? Rubel shared that Edelman partnered with IAB to ping consumers on sponsored content, and many consumers found it useful. Consumers feel companies have expertise to share, so Edelman has a team dedicated to this. Cathey answered, “Professionals in PR are used to real-time. Marketing is learning more than ever how to adjust and react in real time. For example, Oreo’s tweet during a blackout at the Super Bowl in 2013, “You Can Still Dunk in the Dark”. Or Arby’s tweet to Pharrell during the 2013 Grammy’s, (“Hey @Pharrell, can we have our hat back?”). It’s about tapping into the culture in real-time, at the right time. Trounson said that, “In B2B, we work very closely with the sales team. Our goal is to create leads for sales.” Methods of measuring the impact of initiatives on sales will become more relevant and disruptive for B2B companies. Rubel from Edelman summed up the panel perfectly by concluding that, “Constellations—not just putting stars in the sky, but connecting them,” will be key in the media industry in the coming years. This article first appeared on the Akademos blog. The higher education conference season is in full effect. I attended an ed tech conference called UBTech held by University Business magazine earlier this month in Orlando, Florida. This was my first time attending UBTech, having formerly mainly focused on the CampusTech conference. UBTech had a good mix of college and university chief technology officers, chief information officers, chief financial officers, and similar roles. It also attracted ed tech companies, textbook publishers, bookstore services providers, and other organizations in the industry. The data I presented contrasted how college technology officers and financial officers see the future of the college bookstore. For example, while only 18% of college business officers in our textbook delivery survey stated college bookstores will sell textbooks completely via their online store, 95% of college technology officers we (more informally) surveyed at UBTech see the future of textbooks as delivered completely in an online bookstore. Now, given we were at a tech conference, I am not surprised. But the technology folks also noted they are ‘not so much’ involved in decisions about the bookstore. Which leads me to the question, Why are our CTOs and CIOs not more involved in the selection of bookstore service operators and strategies? But if eBook adoption is doubling year-over-year at colleges, when eTextbooks do indeed reach the tipping point, the mass adoption of digital texts by college students will happen “fast and furiously” (to quote the keynote speaker…more on that in a minute). The colleges and universities in my session said this was one of their biggest concerns—they want to be prepared when ‘digital happens.’ So while competition by third party sites selling textbooks (such as Amazon) was a dominant concern for CFOs, digital textbook adoption was the clear driving issue for our information technology officers. UniversityNow identify themselves as a social venture whose mission it is to ensure that a quality higher education is available to people everywhere. They manage Patten University and New Charter University, both online institutions serving predominantly working adults and offering course delivery within a somewhat new paradigm. For example, one set of instructors teaches you, while a different set grades you (anonymously). Tuition is based on how long it takes to complete your program (typically about 2-3K a semester for as many classes as you can muster). Learning is self-paced. Exams aren’t “unlocked” until students can show within the LMS that they have mastered the skill sets needed to pass them. Classes are held completely online. Course materials are digital. Mr. Wade shared that MOOCs have made going to school online “sexier,” but that they are not addressing the market need (eg., a call center employee who is getting left behind because he or she does not have a bachelor’s degree; and needs a convenient, affordable degree that represents key learning competencies learned). According to the speaker, UniversityNow’s flagship school, Patten University, costs 11x less than a 4-year private school. At some schools, cost of operation, of delivery, is higher than net tuition coming in. His point was that we need to lower the cost of delivery or else. His most powerful message? That five years from now, most colleges and universities will be dealing with “the wreckage.” Schools like UniversityNow are happening (as its namesake suggests) now. His metaphor…the rest of world will go straight to cell phones while ‘old schools’ will be dealing with their outdated land-line systems. And, of course, what is that cost of that? This article originally appeared on the Akademos Blog. Torn down the middle. 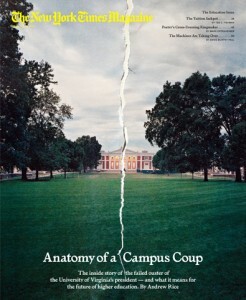 That’s how the NY Times Magazine’s September Education Issue portrayed UVA’s campus on its cover page, along with a dramatic title: Anatomy of a Campus Coup: The inside story of the failed ouster of the University of Virginia’s president–and what it means for the future of higher education. At the heart of the drama seemed to be philosophical differences in how to run an elite institution between those that have more of a not-for-profit/higher ed/government background and those that have more of a business/corporate/Wall Street resume. Where these two groups see the future of education heading caused a rift at UVA’s campus that likely revealed schisms happening at institutions all across the country and the world. To the UVA Board of Visitors, an appointed body that oversees the university, Ms. Sullivan was not “CEO” enough in her actions or her image. The drama played out in the media as potential sexism, political jockeying, and fiscal philosophical differences. But put succinctly, UVA’s board did not think Ms. Sullivan was building enough long term fiscal bets into the strategic plan, such as online programming, and was most certainly not acting fast enough in experimenting with trends like MOOCs (Massive Online Open Courses) along with the MITs of the world. The board had been influenced, in addition to their MBA-ness, by Clayton M. Christensen’s book “The Innovative University,” which focuses on “disruptive innovation” in higher education. Talk to any private equity wonk and he or she will animatedly tell you how education is poised for disruption–the kind of disruption that could make someone a lot money. So why wasn’t UVA taking advantage of its brand name and keeping up with the times? Well, let’s set the scene. UVA is considered a top ranked university, right up there with the Ivy Leagues. What sets it apart from these schools though is that UVA is a public school. So already we are not comparing apples to apples. UVA also has a smaller enrollment than many of its peer institutions. And finally, UVA is committed to keeping a higher mix of in-state students than, say, a University of Michigan (state schools typically charge out-of-state students a much higher tuition, thus those schools that have a higher percentage of in-state students cannot depend on out-of-state students to line the coffers). UVA’s president, Teresa Sullivan, has been called a technocrat, an incrementalist, a consensus builder…all those terms that read slow-moving. Some questioned whether she had the inspired spirit needed to run an institution at the presidential level (president’s are well known for helping to raise funds/endowments and acting as the face of the university). So what does a not-for-profit-type administrator with a background in sociology bring to the table at a place like UVA? Well, we know Ms. Sullivan previously worked as the University of Michigan’s provost, and before that, conducted sociology research at the University of Texas. Her post at Michigan is supposedly one of the reasons she was hired at UVA–she knew how to work in an environment where the state budget was consistently being cut; she knew how to do more with less. While at Texas, where she was “a demographer” and a “numbers cruncher,” she worked on middle class-debt research with Elizabeth Warren, a bankruptcy law professor who has taught at several institutions, including Harvard, has been a Special Advisor for the Consumer Financial Protection Bureau under President Obama, and overall, is considered an expert on middle-class finance policy. Ms. Warren is something of a Wall Street-watchdog, advocating for the middle class in a system she feels is “rigged,” (according to her 2012 Democratic National Convention speech delivered just before former President Bill Clinton’s). Warren is also currently running for US Senate in Massachusetts against incumbent Senator Scott Brown. I mention all this because the NY Times article referred to Warren as a “liberal icon” and touches on conspiracy theories that Teresa Sullivan was singled out because of her associations with anti-Wall Street and/or pro-middle-class fiscal policies. The Times points out that, in hindsight, this seems unlikely, though at the time, it may have fueled some of the flames. But because the Governor of Virginia is responsible for appointing the board, and he happened to be Republican, and because members of the board also happened to be some of UVA’s biggest donors, political suspicions abounded. Many people believe the UVA board used a faculty letter as a proxy to oust Sullivan. Faculty, tired of flat salaries they considered uncompetitive, wrote a letter asking for “urgent and immediate action.” Helen Dragas, rector/leader of the board, began lobbying for support to remove Sullivan. She wrote the following to a fellow board member: “I am growing increasingly nervous that others are thinking about big trends and long term prospects for higher education delivery and funding.” She reached out to board members one-by-one, some say to avoid attracting attention (in Virginia, university board member meetings of more than two persons are public record). She then advised Virginia’s Governor McDonnell of her plans. All systems seemed to be on go for Dragas. What is ultimately interesting about this faculty letter is that the faculty of UVA joined the reinstate-Sullivan-camp after the ouster. The Times summed it up by suggesting that faculty may voice gripes, but when it comes down to it, they prefer an academic in charge over a business person. The faculty, the students, and a former (and influential) board member, all mounted a counterattack. The Times reported that vandals had spray-painted the six front columns of the school’s neoclassical Rotunda with the letters “G-R-E-E-E-D.” And the more the board tried to tell faculty this change was a good thing, the more faculty became “paranoid” that big money donors were controlling the strings at UVA. When Sullivan gave her goodbye speech to the board, people gathered on the lawn to protest her departure. The public relations mess that followed only further riled Sullivan’s supporters. “The national news media seized onto the story, which seemed to dramatize a broader conflict between big money and public education,” according to the Times; and further, “the conservative editorial page of The Wall Street Journal accused the protesting faculty of trying to create ‘an academic Green Zone separated from economic reality,’ while liberal publications held up Sullivan as a symbol of a beleaguered egalitarian ideal.” Ms. Dragas, the leader of the board, lost many of her backers after the decision to remove Sullivan, and Governor McDonnell called on the board to figure this mess out or resign. Sullivan was reinstated as UVA’s president on June 26, 2012. And ironically, on July 17th, it was reported that UVA would participate in a MOOC initiative with Coursera via Stanford University. So what really happened at UVA? Was it sexism in reaction to UVA’s first female president, was it a Republican conspiracy fueled by big donors and a Republican governor, was it MBA/Wall Street bravado? We may never really know. But I think it is an important lesson in public administration. As the public sector adopts the more useful fiscal practices of the private sector, we must remember that feeding the needs of a public entity is a balancing act, even more so than sustaining a corporation. While business courses try and teach leaders how to run a company that treats its employees as more than just human resources, as a part of the company as a whole, in the public sector, the people are our shareholders. And in education, which is a Public Good, whether the school be private or public, we have an obligation to run institutions in a manner that helps our investments–the students who are our future and the faculty who are showing them the way–best flourish. When it comes to complex events that appear seamless, Tribeca Film Festival (TFF) is up there. From movies at various theaters and auditoriums across TriBeCa, SoHo and the West Village, to the TFF Family Fun Fest on Greenwich Street, TFF caters to various audiences–Hollywood industry folks, downtown NYC families, American Express constituents, and more. They even pull off a drive-in movie at World Financial Center which is more of a sit-in sans cars, but large-scale for the area nonetheless. To make sense of all the movies, talks, and events, one used to just mark up a small pamphlet-like book that was organized by movie/event titles, by dates, and by theaters. One often had to cross check various pages to narrow in on which movie at which theater and at which time worked for one’s schedule. 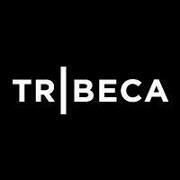 TFF’s website has continued to add features that help Tribeca Film Festival enthusiasts manage their time more efficiently! Plus, the site allows for people to discover movies they might not have otherwise considered by featuring certain films in more visible places within the site. Kudos to TFF for their second Webby for Best Event Website.